A safe, tried-and-tested method for healing hamstring and hamstring tendon injuries. Hamstring tendon injuries are common among runners, yogis and other athletes. The practical, science-based techniques in this book will help you rehab your injury safely and at your own pace. Hamstring and hamstring tendon injuries are painful, not to mention notoriously difficult and slow to heal. If you’re tired of the constant ache, limited function and restricted mobility, and are itching to get back to your regular activities and training, this is your solution. Learn the necessary tools to manage your health and finally put an end to the cycle of chronic inflammation and irritation once and for all. A conservative method, based in physiology, that harnesses the body’s own ability to heal. No woo woo nonsense. A detailed explanation of the healing process: you take charge and participate intelligently and actively in your own rehab process. Progress at your own pace: modifiable exercises for each phase of the healing process, designed to gradually strengthen the injury site, maintain range of motion, build functional strength, and injury-proof your hamstrings for the long haul. Optional video sequences targeted to various stages of the healing process. While these are yoga-based, they are suitable for all levels and there is zero yoga experience needed. When I went to work with Jenni, I had been suffering from high hamstring tendinopathy for over a year; I had tried conventional physical therapy, acupuncture, and dry needling, each with only limited success. After being a runner for over 40 years, I had been unable to run for almost an entire year, and found myself not only in fairly constant nagging discomfort, but very limited in what physical activities I could do without pain. Jenni devised a program of exercises and myofascial release that could be done at home with simple equipment and in a short time frame each day. Within a few months, I had resumed running (which I wasn’t sure would EVER happen!) and I walk 18 holes of golf three or four times a week pain-free. This is a physical quality of life I wasn’t sure I’d ever enjoy again, and I appreciate every minute of it! Jenni is an experienced, skillful teacher who is always expanding her knowledge of anatomy, biomechanics, and the ways movement affects the body. 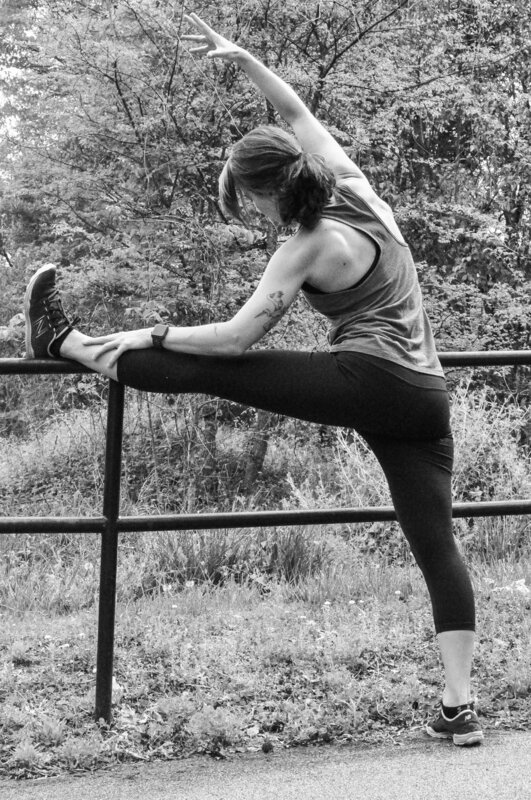 In Stronger With Yoga: Hamstring Injury Rehab, she integrates her vast expertise to help people at every level of yoga experience rehab and injury-proof their hamstrings. Her clear explanations, useful instructions, and extremely helpful video supplements will all help you feel stronger with yoga. I look forward to seeing more in this important series! After years of running, I started having pain right below my glute in my upper left hamstring. After being diagnosed with hamstring tendonitis, I was put on naproxen and told to quit running. The naproxen had significant side effects, and I was not interested in giving up running. I went through months of PT and dry needling, which relieved my pain for about 48 hours, but then my symptoms returned during my runs. Eventually, I began having pain in the front of my leg as well and decided I needed to try something else. After just a few sessions with Jenni I noticed a significant decrease in my pain and in a few months I was running pain free! Hamstring tendon strain is one of the most common injuries I see in yoga students. In fact, as a yoga student who took up trail running, I experienced the same issue myself in the past and found the niggling, recurring pain very difficult to resolve. This book is a fantastic resource, providing practical information to anyone interested in learning more about hamstring tendon strain and how to address it. It provides clear, simple steps to manage the injury and prevent it from recurring - empowering to athletes, yoga students, and teachers alike. This book thoroughly covers a wide range of information to provide a comprehensive method for rehabilitating this common injury. I appreciate the scientific outline of fascia and tissue physiology, the education on what's actually happening in the body, and love that yoga philosophy is woven in to aid with the psychological aspects of the healing process. Additionally, the exercises are perfect- nothing crazy, and totally doable for yogis and athletes of all levels, with minimal equipment. This truly is awesome; a very practical and useful tool, and I will absolutely be recommending this to my students and the athletic teams I work with. Stronger With Yoga: Hamstring Injury Rehab is not only an invaluable resource for anyone who has suffered a proximal hamstring injury - it's also a perfect guide for anyone interested in preventing this type of injury. In this book, Jenni shares her in-depth knowledge of this topic in an accessible, easy-to-understand way. She offers expert, thorough instruction in all of her exercise recommendations, along with clear, helpful photos for illustration. As a yoga teacher myself, I can attest to the high amount of hamstring tendon injuries we see in the yoga world. This excellent book is a treasure for any yogi who is dealing with this issue - and any yoga teacher who would like to help such students in an informed, smart way. These video sequences are designed to be a comprehensive resource to take you through the entire rehabilitation process, from post-injury to long term strengthening and reinjury prevention. Each video is targeted to a specific phase of the healing process and directly corresponds to specific chapters in the e-book. While these sequences are yoga-based, they are suitable for all levels and there is zero yoga experience needed. We highly recommend utilizing these videos to gain the full benefit of the materials contained in the e-book. Stronger With Yoga was created by Jenni Tarma as a resource for athletes, active people and anyone wanting to move with efficiency and ease. She is a E-RYT200/ RYT500 yoga instructor, RRCA-certified endurance coach, Yoga Medicine Registered Therapeutic Specialist, CrossFit athlete and an enthusiastic if not particularly skilled surfer. Jenni teaches public classes and works with private clients, many of whom are recovering from injuries, seeking to improve athletic performance, or simply wanting to feel better in their bodies. A lifelong athlete and accomplished runner, Jenni’s interest in movement, biomechanics and anatomy have led her to study extensively with renowned teachers such as Sage Rountree, Tiffany Cruikshank and Jules Mitchell. She also loves to write and is a regular contributor to Yoga Journal on the topics of anatomy and yoga for athletes, as well as contributing video content to Yoga Vibes. She is the manager of all three Carolina Yoga studio locations.